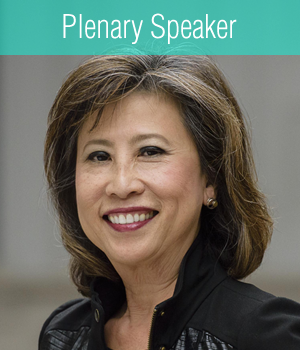 Elizabeth Chu Richter, FAIA, is the CEO of Richter Architects based in Corpus Christi, Texas. The firm is a recognized leader in the profession with award-winning designs. It was honored with the prestigious Architecture Firm Award from the Texas Society of Architects in 2011. Recent projects include the National Museum of the Pacific War, Mission-Aransas National Estuarine Research Reserve, Del Mar College Academic and Music Complex, Manila American Cemetery Visitor Center in the Philippines, and GSA Design Excellence U.S. Land Ports of Entry in El Paso, Laredo, and Columbus, New Mexico. Elizabeth was elected to serve as the 2015 national president of the American Institute of Architects (AIA). She became the first Asian-American woman and the fourth woman to served as national president in the Institute’s 158 year history. The AIA has over 87,000 members in the U.S. and abroad. Elizabeth is an honorary member of the Japan Institute of Architects, the Korean Institute of Architects, and the Australian Institute of Architects. She is frequently invited to speak on leadership, design, and the future of the architectural profession, Most recently, she lectured at the Savannah College of Arts and Design. Elizabeth believes in the power of architecture to impact lives and elevate the human spirit. As such, she has championed public outreach for decades. In addition to design, writing, and speaking, she created and co-produced The Shape of Texas, a statewide radio series on architecture broadcasted on NPR-affiliate stations across Texas. The series ran for 11 years, broadcasting over 500 episodes and reached millions. She also chaired the prestigious AIA Gold Medal/Firm Award Advisory Jury Committee and served as a juror for numerous national and regional programs that recognize design excellence such as AIA New York design awards. Active in community service, Ms. Richter served as Chairman of the Board of Directors of the San Antonio Branch of the Federal Reserve Bank of Dallas, and as Chairman of the South Texas Public Broadcasting System. She is a former board member of CHRISTUS Spohn Health Systems and the Board of Directors of the Corpus Christi Regional Economic Development Corporation. She recently spearheaded a community event focused on designing healthy communities.